Flavor Text: "If Johnny sees 'em togetha', they're both as good as dead." How does this work? is it JUST for the first character? how does it reduce the cost when after you've played it it's in play and you don't pay the cost anymore? It will only reduce the first Criminal every turn you play, so long as she is still in play, with multiples of them stacking their reduction, though you will always pay at least 1. 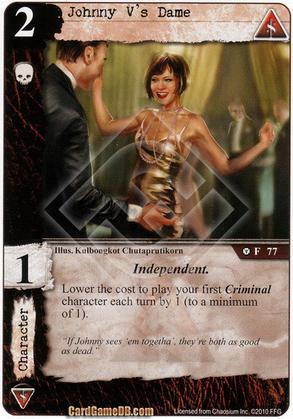 Also, beware that if you play a Criminal, then Dame, you won't get the reduction if you then play another Criminal, as whilst it's the first one since she was in play, they aren't the first Criminal that you played that turn.